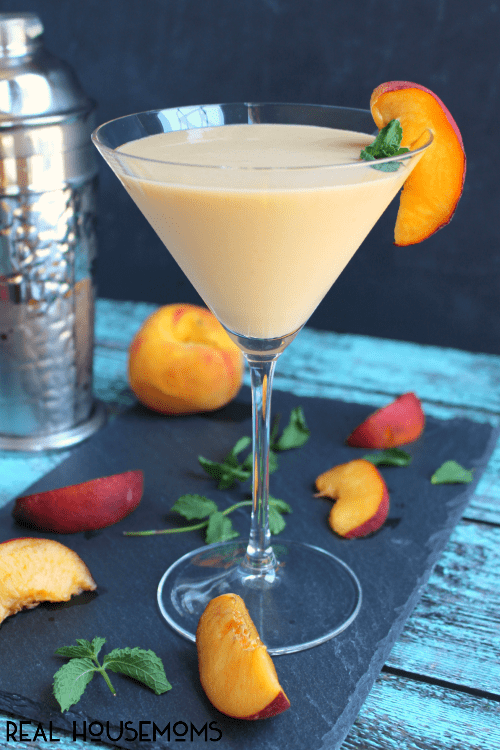 This Peaches and Cream Martini is fun summer cocktail, perfect for sipping on the patio! 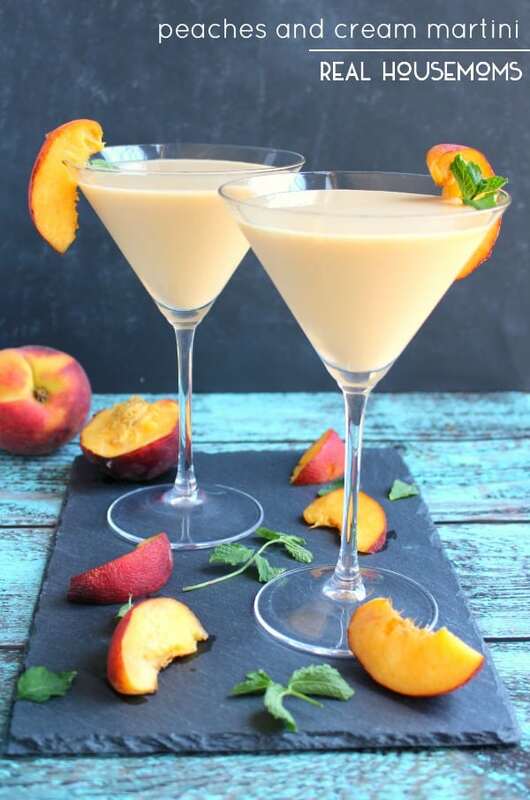 Made with fresh peaches, cream liquor and a couple other goodies, this cocktail is cool, creamy and completely delicious! Once summer rolls around, it seems I’m always looking for delicious cocktail perfect for enjoying at the end of a hot day. I love nothing more than sitting outside on the patio, watching my boy play in the yard, listening to the birds and sipping on something delicious. As peaches come into season, their sweet, fragrant flavors are amazing in cocktails. To create this sweet, creamy libation, I pureed a ripe peach and used it as the base for my drink. If you don’t have fresh peaches available yet, canned or frozen peaches are a good substitute. 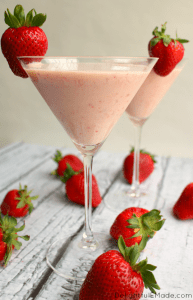 A fun summer cocktail, perfect for sipping on the patio! 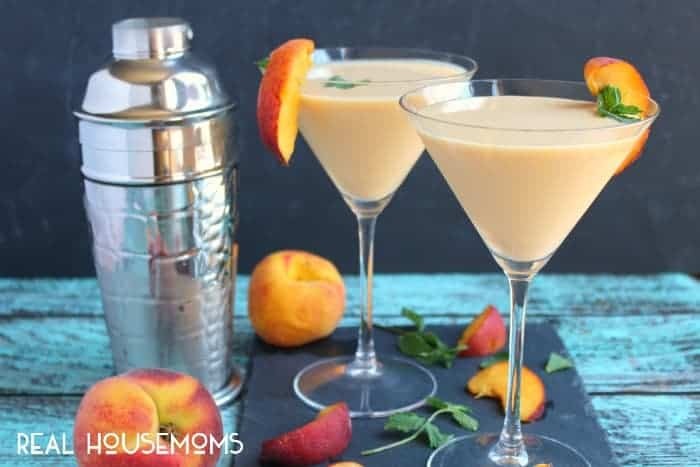 Made with fresh peaches, cream liquor and a couple other goodies, this cocktail is cool, creamy and completely delicious! In a cocktail shaker, or mason jar, add ice, peach puree, schnapps, cream liquor, and triple sec. Shake vigorously. Strain into two martini glasses. Garnish with peach slices, if desired. Enjoy right away. Another great way to enjoy this cocktail is to add some frozen peach slices to your glass. Pour the cocktail over the peaches and enjoy. 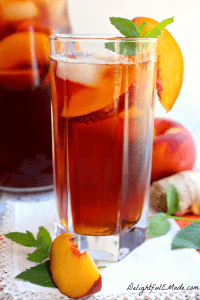 The peaches will not only keep your drink cold, as they thaw, they will continue to flavor your drink! This looks fantastic! I’ve pinned it! I would love it if you would link it up to Tipsy Tuesday at my other blog, Grey is the New Black!